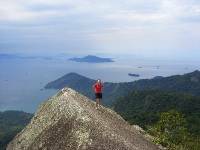 Blog from Ilha Grande, Brazil | Where is the Love? After a couple of days in Rio we headed South on the start of our tour. We started off in luxury with our own private mini bus from the hotel to the ferry for Ilha Grande. We got to the ferry only to find we had to wait about 4 hours for another GAP tour to join us. We think waiting around could become a common theme on this trip. To pass the time we headed to the only restuarant in the village. For less than GBP2 we had a feast of rice, beans, chicken and salad with the locals. We then spent an hour relaxing on the near by beach where we looked a bit out of place next to the bronzed Brazilians. We got our boat over to the island, captained by Netto the Brazilian play boy. On first sight the island looked like Jurassic park, lots of trees and hills. It used to house a high security prision but now it is a tourist island. We checked in to our pousada and headed to the beach again for some beers. It´s a tough life! The next day we spent on Netto´s boat crusing around the island. Stopping to swim with fish and turtles in between all you can drink Caiparihnas (local sugar cane rum and lime cocktails) and an on board BBQ. We have noticed that Brazilian men think it is acceptable to swagger about all day in tiny speedos. Nelson, one of the crew on our ship, sported a pair with ´Vitamins and Minerals´across his bum, which was highly amusing after a few rums. (Hopefully you can see what we mean from the photos!). The next day on the island was a free day on the trip. All the others headed to the beach. Not us! We decided to do out first hike of the trip, to Parrot´s peak at the top of the island. To get there we had to climb for 3 hours up through the jungle in the blistering heat. We saw a snake, lots of lizzards that looked like mini crocodiles, and we heard something that sounded like a boar! However that could just have been one of the local stray dogs (glad of the rabies jags now!). The effort to get to the top was definitely worth it though as we got 360 degree views over the island. Hope the you can see from the photos (we are having a few IT issues uploading them). Today we are back in Rio for a couple of hours before we get a 15 hour night bus to Curitba en route to Igassu falls.